Frank's Cafe in Peckham is open Thurs - Sun every week, but now chefs are hosting special bookable nights on Tuesdays. This started in late July (I've only just found out) and there are four more planned, including this one by Max & Federico Sali of Italian restaurant Tinello - see the full list here Tinello's night on the 13th is £50 per head, and if you arrive at 6.30 you can get a special talk by one of the Bold Tendancies art works in the space by curator Joe Balfour. The dinner starts at 8pm. "On Tuesday 13th August at 8pm, Chelsea based restaurateurs Max & Federico Sali of Italian restaurant Tinello will be showcasing their menu at Frank’s Café, located on the tenth floor of a multi-storey car park in Peckham Rye. Frank’s Café re-opened again for summer at the end of June and this year sees the venue showcasing some great talent every Tuesday, including that of Tinello. Much like Frank’s Café, which opened its roof back in 2010, Tinello has been serving food lovers and imbibers alike for several years and has firmly established itself as one of London’s great Italian restaurants. As a destination venue, diners will enjoy not only the picturesque London skyline but also a four-course menu constructed by head chef Federico to include “Soppressata” rocket, shallots, capers and parsley salad, egg penne duck ragout, T bone steak roast pepper and lemon salad, Fresh peaches and almond granite among other Tuscan delights. Likewise, the restaurant - renowned for its wine selection - will be offering imbibers Chianti Lamole and Vin Santo, wines that have been selected by sommelier Max Sali. Federico Sali comments, “We are really excited about this event. For years, Frank’s Cafe has been known as a stunning destination for both the food and the views alike. We are so grateful for this collaboration and have our fingers crossed for a warm, dry day’, there is luckily a large retractable roof if not. 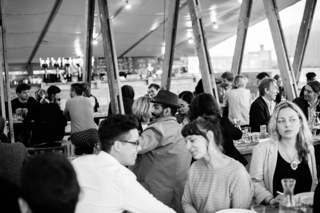 From up market Chelsea to a multi-story car park in Peckham, Tinello offers Italian food at its best and if the weather remains as forecasters predict for this one-off pop-up event, guests will feel as if they’ve been transported to a piazza under the Tuscan sun." "The Car Park is a well sign-posted 3 minute walk from Peckham Rye station. Turn left down Rye Lane, and shortly turn right at the Abbey National building society, at which point you'll see the Multiplex cinema facing you. Take the yellow lift to the right of the cinema entrance to Level 6. Follow signs to Level 10. The drive-in entrance to the Car Park is on Cerise Road (SE15 5HQ). Parking is available on Level 6."